Everyone loves to look and feel their best, but sometimes fitness routines and body image can be a source of stress rather than positive encouragement and happiness. As part of the POPSUGAR Insights "Find Your Happy" study, we identified that women struggle with certain "stress zones", including their body image, their overall physical fitness and their nutrition, diet and eating habits. We then asked women to flip the script, focus on positive achievements and milestones, and tell us what makes them happiest when it comes to working out and eating right. Overall, 63% of women said that looking good in their clothes is what makes them happiest about dieting and working out. 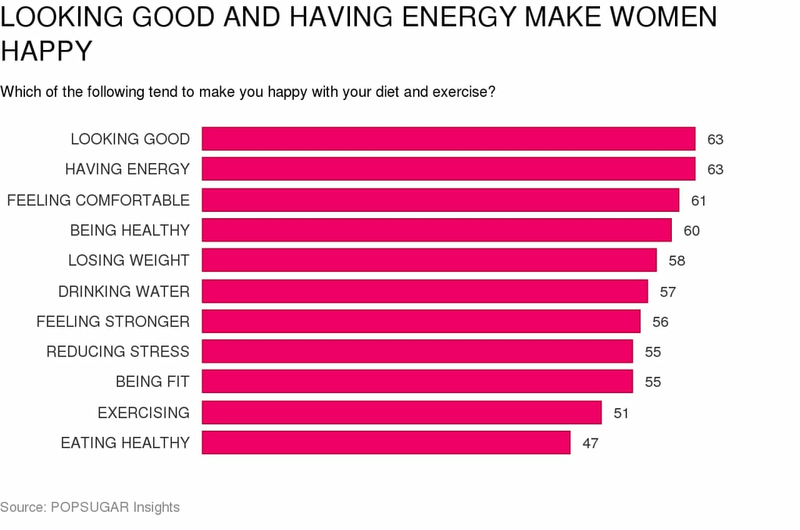 Nearly 63% of women said that having energy makes them happiest. Sixty-one percent of women said that feeling comfortable in their clothes makes them happy, and 60% said that being healthy overall makes them happy. Women between the ages of 18-24 were less likely to be concerned with looking good in their clothes (60%) and more concerned with having energy (66%), being healthy overall (65%) and drinking water (64%), while teen girls were more likely to be concerned with feeling stronger (63%) and not comparing their bodies to other women's bodies (44%). The specific areas that help women become healthier, while important, do not necessarily make them happy. Only 15% of women said that keeping up with the latest health, diet, and fitness trends makes them happy, and only 23% enjoy watching their portions or calorie intake. Only 31% enjoy sticking to their diet, and only 27% of women said that tracking progress against personal goals makes them happy, proving that there's an opportunity to make the chores related to diet and exercise more fun and to improve how women feel about these experiences.